Animal Holistic Therapies offers specialist alternative treatments in the greater Sydney area for your beloved pet or sporting animal. Horses, dogs and even the odd cat! "What an amazing man Neil is!" "Neil is highly skilled and caring... Can't say enough." "Couldn't recommend Neil highly enough. So caring..."
"I can't praise them enough... Very kind and knowledgeable." Please call us today for an assessment of your animal's needs. I'm Neil Barnsley, the principal practitioner at Animal Holistic Therapies. 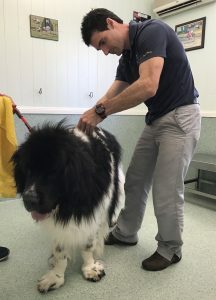 As a third-generation practitioner in this unique field of specialist alternative treatments, I'm passionate about caring for your dog or horse in a natural and practical way. All treatments are animal focused and I am proud of the positive effect I've had on the lives and quality of life for the animals in my care. I invite you to contact me to see what the best therapy options are for your animal companion.